I used to read a lot of Historical Fiction but then suddenly I lost interest a couple of years ago. But when I read the name Karen Maitland I got tempted. I loved her books, especially “The Company of Liars” and “The Owl Killers”. I loved her dark and mystical stories. 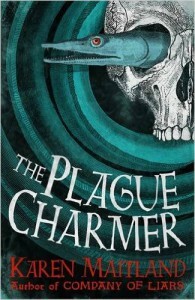 “The Plague Charmer” is equally dark and mysterious even if it is not as good and compelling as them. The story is set in England during the second wave of the Great Pestilence. A woman is washed ashore at a small village in the Exmoor area. She tells them that the Plague is coming and she offers help. But her price is too high and the godly people don’t want her witchcraft. But soon the first people fall ill. There are a lot of characters, several POV and the story gets more complex with every chapter. The author creates a very dark and baleful atmosphere. I wished the story would have been more gripping in the first half of the book. It took some time until the story picked up pace. I think there were to many characters, too many sub-plots. And there are some things which just stayed unexplained. This thing about the mysterious which-like woman from the sea is never really explained f.e. There are a lot of historical notes from the author at the end which are very interesting and revealing but I just missed some explanation or even mentioning of some of the things that happened in the book. This is the reason I can only give 3,5 stars. But for me Karen Maitland is still one of the best authors of historical fiction although “The Plague Charmer” does not reach up to “The Company of Liars”.